In 1997 Valkó et al. developed a generic fast gradient HPLC method, based on the calculation of the Chromatographic Hydrophobicity Index (CHI) from the gradient retention times, in order to measure lipophilicity. We have employed the correlations between CHI and log Po/w and adapted the rapid gradient HPLC method to UHPLC obtaining excellent resolution and repeatability in a short analysis time (< 4min). log Po/w values can be easily obtained from these CHI measurements but, unfortunately, these correlations are only valid for non-ionized compounds. Consequently, in order to determine the effective log Po/w value at a particular pH, a fast high-throughput method for pKa determination was required. The IS-CE method, based on the use of internal standards (IS) and capillary electrophoresis (CE), is a fast and attractive alternative to other methods for pKa determination, since it offers multiple advantages compared to them: low amounts of test compounds and reagents are needed, high purity is not required, specific interactions between test compounds and buffers are corrected, etc. In addition, it allows the determination of a pKa value in less than 5 minutes. 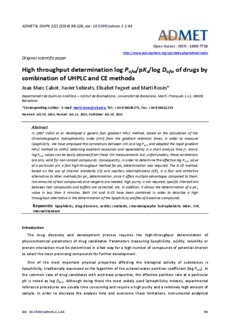 Both CHI and IS-CE have been combined in order to describe a high throughput alternative in the determination of the lipophilicity profiles of bioactive compounds.